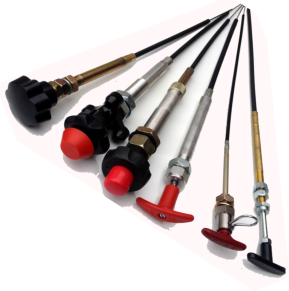 Conwire manufacture a range of hand-operated control head cables. Typical applications for these controls include: power take-offs, remote control engine throttles, valves, chokes, shut-offs and various mechanical linkages that require remote operation. Non-lock control heads are designed for remote engine shutdown/choke, latch/valve operation, and numerous other applications. These panel or bracket mounted units are intended for light to moderate loads. They are cost effective solutions to mechanically connecting a manual input source to a remote output, especially when space is limited or rod linkage and bell cranks are not suitable choices. Various T-handles/knobs with or without functional identifications, as well as output end configurations are available. The ordering code and technical description shows the numerous choices.